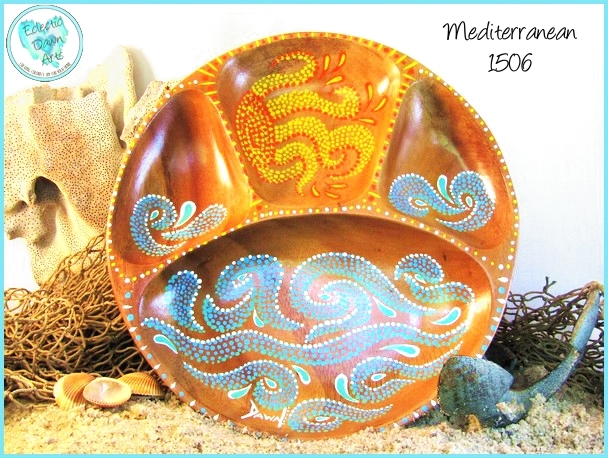 "Mediterranean" Bowl - TB1506 (accessories not included) Approximately 10" in diameter, this delightful hand-painted round divided bowl is re-imagined with colorful dot painting waves and sun, like a mosaic, with aqua, white, red, and yellow points of color. Add a sparkle of the ocean to your decor, with thoughts of the sea and coastal waves, where ever you place this piece! Not food safe, clean with damp cloth, do not put in dishwasher. Free shipping. 'Maui Morn' Trinket Tray or Decorative Bowl, TB1703 (accessories not included), ~6 x 6.75 inch (sizes are approximate due to the organic shapes). Wishing you were at the beach? 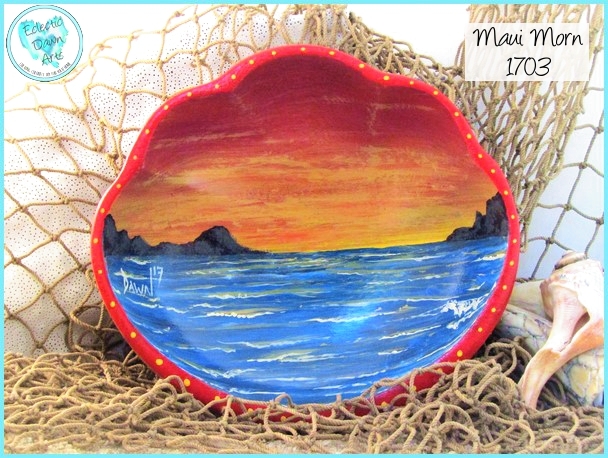 Enjoy an ocean sunrise anytime you'd like with this hand painted bowl; a yellow, orange, pink red sky wakes up over the waves of the ocean. 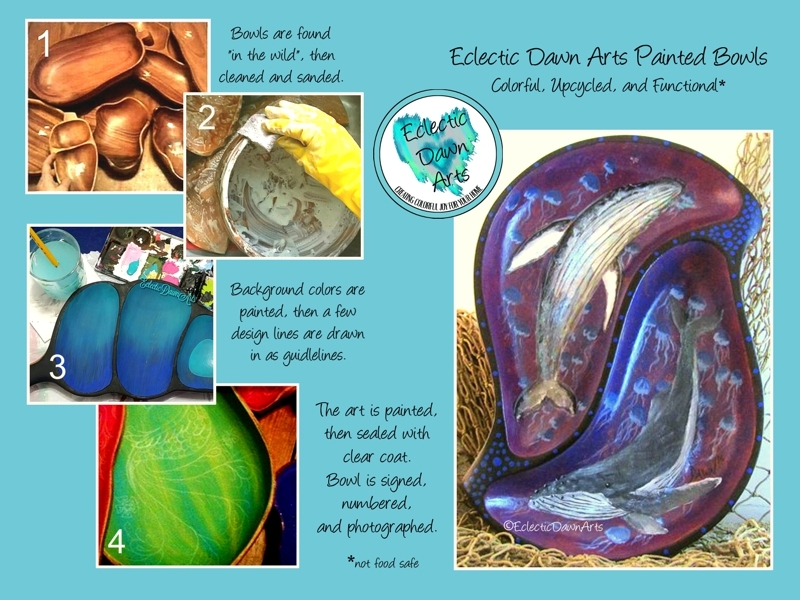 This is a great piece on its own, but can be used for jewelry, hairpins, or keys, too! Free shipping. Not food safe, clean with damp cloth, do not put in dishwasher. 'DUSK' Decorative Bowl or Trinket Tray, TB1704 (accessories not included), ~6 x 6.75 inch (sizes are approximate due to the organic shapes). Is there anything as peaceful as nightfall at the beach? 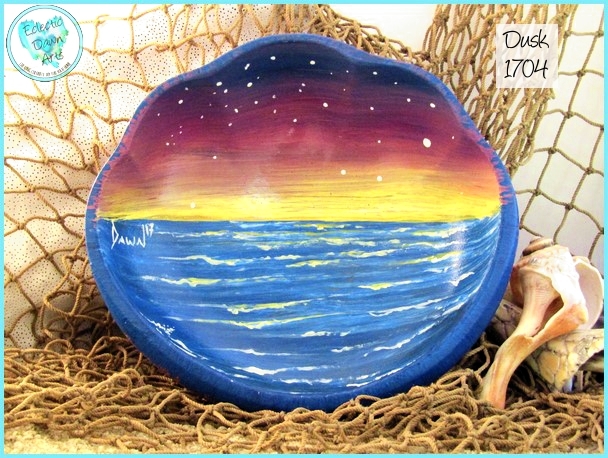 You can have your own beach sunset to look at any time you'd like with this colorful bowl art piece filled with the colors of dusk: blue, purple, and yellow, with stars over the gently rolling ocean waves. Free shipping. Not food safe, clean with damp cloth, do not put in dishwasher.